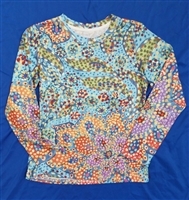 This lovely long sleeve T-Shirt is made with 90% Cotton / 10% Spandex. The sizes run "one size smaller" so when ordering...order one size bigger. We do make these in larger sizes if needed, just email us or call us and we can place a special order in for your size. Care of garment: Machine wash in cold water, hand dry. 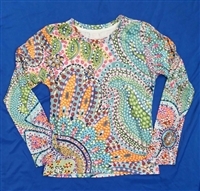 This lovely long sleeve Top is made with 90% Cotton / 10% Spandex. The sizes run "one size smaller" so when ordering...order one size bigger. 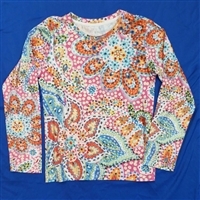 We do make these in larger sizes if needed, just email us or call us and we can place a special order in for your size. Care of garment: Machine wash in cold water, hand dry. If in stock, it will ship out next day. Otherwise it takes 3 weeks to make for you. Smock Dress with Flared Skirt "Groovy Kind of Love"
This beautifully feminine dress is very figure complimentary! You can wear this to the office, out to dinner, or, simply as a day dress to go out shopping! Made of of Lycra and Polyester. Cold water machine wash. No wrinkles, no fading, no shrinking. You will look fabulous and feel beautiful! If in stock, we ship out the next day. Otherwise, 3 weeks to make and ship out to you. 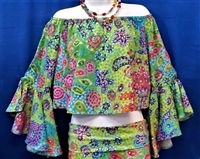 Kimono-Chiffon- "Groovy Kind of Love"